Pascolo Ristorante, 83 Church Street, Burlington, 497-1613. pascolovt.com. Pascolo begins lunch service this Wednesday, June 18. We're all familiar with the pasta dish known as carbonara, but not necessarily with its inspiration, an Italian secret society called the Carbonari. Formed early in the 19th century, these "charcoal burners" are credited with a key role in unifying states on the Boot into what we now know as Italy. 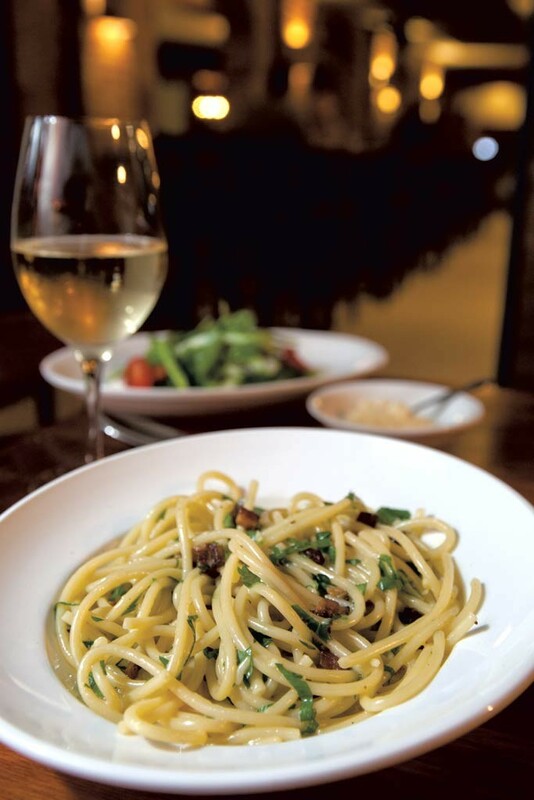 Carbonara, which first appeared circa World War II, was named in honor of those patriots. But as I dug into the remarkable bucatini carbonara at Burlington's Pascolo Ristorante, I was reminded of another secret society, contemporaries of the Carbonari: the fictional Pappataci of Rossini's 1813 opera L'Italiana in Algeri. Their creed is silently eating to excess; their name means "shut up and chow down!" A taste of Pascolo's carbonara (on bucatini, a thick spaghetti with a thin hole in the center) inspired me to do just that. Carbonara is traditionally a fat bomb, choking with bacon, eggs and cheese. But in the kitchen of executive chef Kevin Sprouse, the pancetta, egg and pecorino are brightened with a garden's worth of herbs and a shot of lemon. Recognizably carbonara, but smarter and cleaner, the dish will continue to inspire hushed superlatives in my party for years. Luckily, we can all join Pascolo's not-so-secret society. While there are still a few crimps to work out on the menu, service during my visits was uniformly exceptional. More dishes were soaring arias than tuneless recitatives — and several are sure to become Queen City staples. The stairway descending from Church Street to the basement long known as Three Tomatoes Trattoria has its own air of mystery, worthy of the Pappataci. 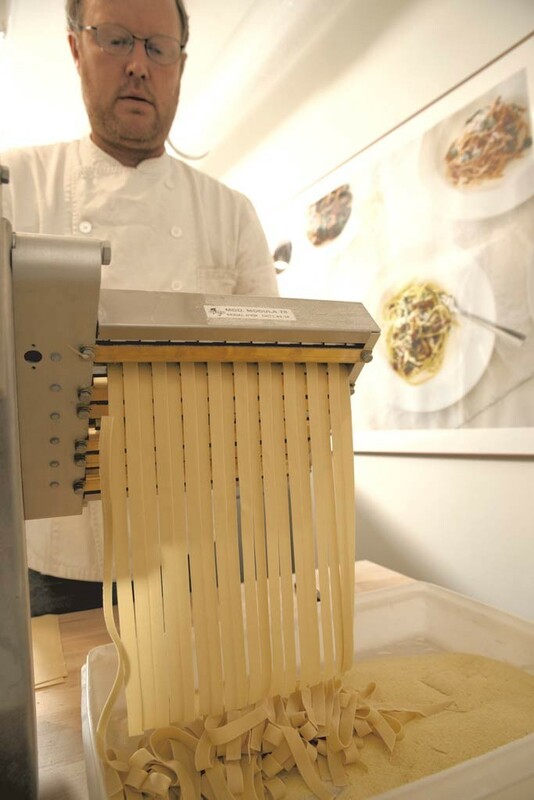 Still recognizable from its most recent incarnation as nika, Pascolo has the unmistakable sheen of a Farmhouse Group restaurant, including a snazzy window that allows guests to watch chefs craft seven different pasta shapes from scratch. Those pastas are paired with a list of carefully selected wines, including bottles grouped by the region in Italy where they were crafted. Wine director Alex Moran has even devoted a menu section to wines that will satisfy a brew hound. Suds lovers not as willing to explore can choose from six taps, including two Italian specialties and a house brown ale from Long Trail Brewing. Sean Mckenzie crafts creative cocktails using Italian spirits, too, such as the "Toe of the Boot," featuring Aperol, Gran Gala orange liqueur, strawberry preserves, lime, reposado tequila and the soft drink chinotto. Pascolo is the fifth outing as managing partner for Farmhouse Group's Jed Davis, and one with special weight. As a youth, he made the decision to pursue a career in restaurants while dining with Three Tomatoes co-owner Jim Reiman. Davis grew up to manage Three Tomatoes. But his own deployment of the cork-and-brick-bedecked space is a very different animal. 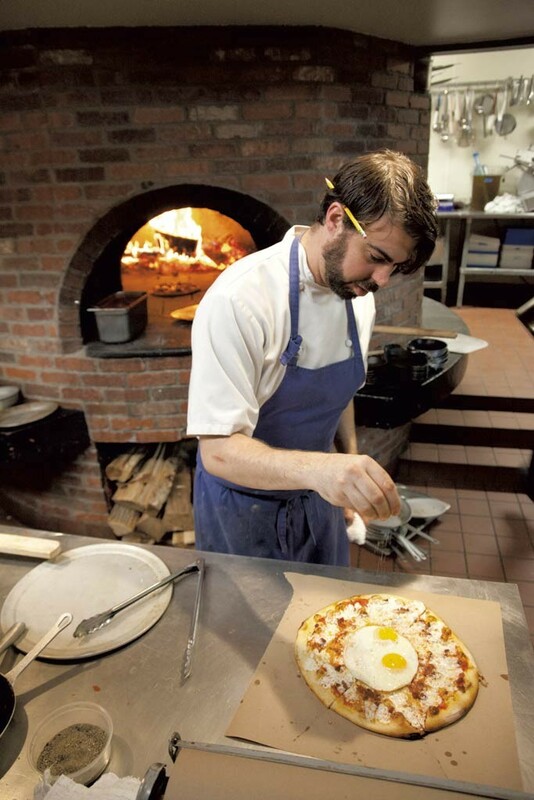 The wood-fired ovens still burn at Pascolo with nearly a quarter-century of seasoning, and red-sauce dishes make several appearances. But the menu tends toward the more refined dishes served at Trattoria Delia and L'Amante. One ingredient both of those older Burlington restaurants lack is a Church Street location with outdoor seating. My first for-review Pascolo experience mimicked a Roman holiday, with my dinner served al fresco for optimal people-watching. I was in a bit of a hurry that night, and my server succeeded in offering my party three courses in little more than an hour. On a warm day, the asparagus salad was more refreshing than a glass of lemonade. Indeed, lemon dressed the shaved asparagus, greens and cherry tomatoes. But it was a dose of mint leaves that really hit the spot. Twin piles of house ricotta were pleasurable bites, but the salad would have shone without them. With three bruschettas on the menu, trying one was a must. The most original version was coated in bone marrow, butter and gremolata. The three teeny crostini smeared with creamy marrow left me wanting more, especially considering their $8.95 price point. I made up for the low carb count with a slice of airy, oil-and-herb-topped focaccia, not unlike a lighter version of my mother's challah. Chicken Parmigiana, a welcome nod to lower-brow Italian fare, was the restaurant's greatest disappointment. The chicken breast is usually pounded thin, but this one was thick, oversalted and dry. That was a pity, since the chicken's crust was admirably crisp and its red sauce balanced just right between sweet and sour. The homemade mozzarella on top was only lightly melted, without a hint of the nascent brown I look for. Worst of all, the bed of spinach was insufficiently washed and gritty. The saving grace was a $3 side order of spaghetti I'd added. Wiry and chewy as ramen, it was an unexpected hit. That pasta may even have outshone my main-course plate of pappardelle con funghi. The homemade pasta was cooked more than the satisfyingly al dente spaghetti and bucatini, but what it lacked in fun for my jaw, it made up for on my palate. The paper-thin mushrooms had been cooked in the wood oven, which imbued them with a whiff of smoke. The creamy sauce was all decadent comfort, though it lacked the truffle and rosemary flavors mentioned on the menu. Coffee tends to overwhelm my palate, so I usually avoid tiramisu. But my server was right to steer me toward Pascolo's version. Served in a Mason jar, the parfait of Vermont Creamery mascarpone mousse and espresso-soaked ladyfingers betrayed barely any of the bitterness I expected. It's the only tiramisu I've had that I would order a second time. Later in the week, I ventured below ground for a second meal, which easily topped the first. For more than a decade, I've had an annual tradition of splurging on a plate of fried mozzarella. From now on, it will be the one at Pascolo. There, the medallions of homemade, gooey cheese are coated in basil bread crumbs, then served with a squiggle of tangy salsa verde and a bowl of the restaurant's pitch-perfect red sauce. On the opposite end of the spectrum, the priciest dish on the menu, a $25.95 swordfish filet, was a great alternative for diners trying to "eat clean." Striped with grill marks, the tender fish was moments of cooking away from falling apart. The touch of fire lent its mild flesh a strong flavor. On the side, a pile of white beans and tomatoes conjured a lighter, Mediterranean version of cassoulet. A salad of crisp arugula and sunny orange segments reaffirmed the taste of warm-weather, seaside dining. Ten different pizzas can emerge from Pascolo's oven, though I saw few parties order them during my meals. Each is large enough to serve two reasonable people and has a crisp, chewy crust that suggests a slightly thicker version of the one once served at Three Tomatoes. I chose the thoroughly Sardinian pane frattau as a way to try the basics along with the pie's toppings. 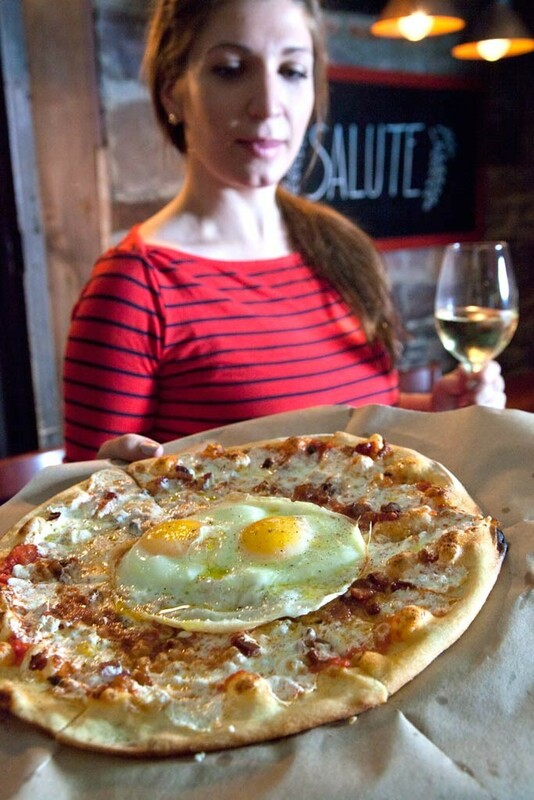 But the real attraction was a pair of fried eggs on top, placed at the center of the pizza like crossed eyes. While the edges of the whites were crisp, the eggs' yolks ran over the fresh mozzarella like a second sauce. The thin crust was just sturdy enough to stand up to the yellow river, along with a light (almost too light) layer of red sauce and cheese. Crunchy cubes of pancetta added a burst of salty fat, while fresh garlic stuck in my teeth, enabling me to carry reminders of the pizza's flavors with me throughout the evening. That didn't detract from my enjoyment of the thoroughly non-European Jimmy Carter sundae. Earlier, on my own time, I had tried and loved Pascolo's Amalfi sundae with lemon curd and crunchy hazelnut biscotti. Its one flaw was unappealingly grainy homemade vanilla gelato. I ordered the Jimmy Carter — which features both chocolate and vanilla gelati — to find out if the sweet stuff had improved. It had, and then some. The grit had been replaced by the sought-after buttery texture that defines gelato. The chocolate was more intensely flavored than the vanilla, but it didn't matter when both were drizzled with amply salted caramel. A few pieces of homemade peanut brittle added a pleasant crunch, but were sweeter than necessary when mixed with the other, subtler flavors. Where Pascolo really succeeds, though, little is subtle about it. Big, bold flavors, spot-on service and original dishes would be enough to get even a Papatacci talking.